In the 1980s, single-species conservation projects abounded with concerned groups fighting to save the rhino, cheetah, tiger, blue whale, and many others. People ‘declared war’ on poachers and made a lot of impassioned noise. In the ‘90s, people started to see how the conservation of particular species was contingent on our ability to conserve entire ecosystems. Consequently, charismatic species became flagships for the protection of natural areas. Still conservationists seemed to be losing ground. They began to see people as an unfortunate hindrance to their efforts as local communities poached the very last rhino or hunted down a beautiful tigress (she was eating their children). Recently, however, conservation efforts have begun to see people as the essential foundation for species preservation programmes; but the greatest question for global conservation remains: how can we get people to want to protect that which is around them? 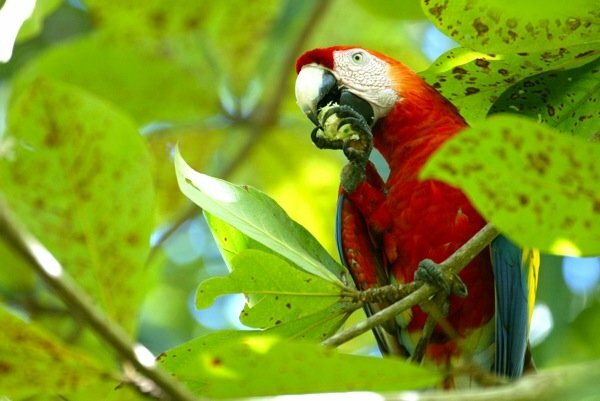 The Scarlet Macaw was once found through 85% of Costa Rica, but capture for the international pet trade and forest destruction has reduced this once numerous bird to only four localities. CITES restrictions have subsequently reduced the capture for international markets, but adults and nestlings continue to be taken for sale within Central America. Parrots are extremely popular pets in Costa Rica with the resplendently coloured Scarlet Macaw (Ara macao) being the most prized and expensive of all. Driven by greed, a nest- robber needs to be able to find an active nest, and needs to have the support (or indifference) of the local community. Only through a community conservation ethic can the greed of a few be marginalised. 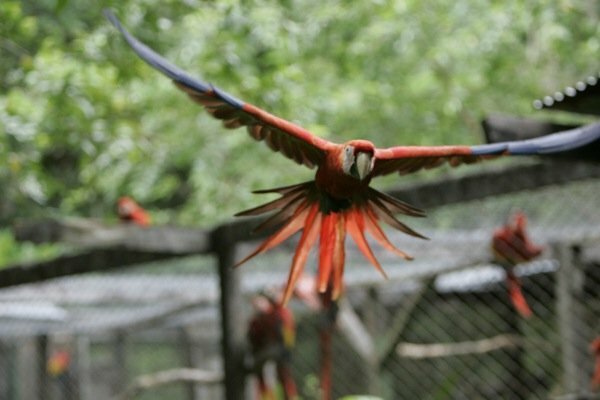 In September 2002, seven captive-bred Scarlet Macaws were reintroduced by Asociación Amigos de las Aves (noThe Ara Project) in to the Punta Banco area of southern Costa Rica. It had been almost thirty years since macaws were last seen whirling through the canopy of these rainforests. Their return to the area signalled more than just the beginnings of a restoration programme but was equally a sign of a growing conservation consciousness amongst the people of the area. The beachfront football pitch is at the very heart of the small village of Punta Banco and its 80 residents often collect to socialise around a game of football as the sun dips lazily into the Pacific Ocean. Behind the village, the land disappears into the hills of tropical rainforest and cattle pastures that extend to the unmarked Panamanian border, only 9 km away. Tantamount to the development of conservation thinking in the area has been the Tiskita Jungle Lodge, an ecotourism reserve specialising in allowing people to experience the wild rainforests with a modicum of comfort. The economic viability of the lodge provides environmentally sustainable employment to a large number of local villagers and has helped develop the ethos that environmental protection is not only economically beneficial but intrinsically important as well. In 2003, we started a project to monitor the released macaws more closely. Conservation is all about the people who live on the ground. Football and macaws are inseparable. Initially, this involved the establishment of a scientific protocol for data collection. We soon realised that keeping track of the movements of the macaws through hilly, forested terrain was incredibly difficult and any macaw could disappear in a matter of minutes simply by rounding the crest of a hill. A six-minute flight for the macaws would take us more than an hour to walk! It was like we needed eyes everywhere in the 15 km2 range of the macaws. “Have you seen the macaws today?” became our catch phrase as we visited families and spoke with people everywhere we went. We meticulously recorded sightings by locals and these data went a long way in developing a more complete view of the general ranging patterns of the macaws. Soon we noticed that the residents started to pay more attention to the macaws (noting flock numbers, direction of flight and time of day) because they were frequently asked about sightings. Then the unexpected happened. The more the people noticed the macaws, the more they appreciated – and admired – them. Soon they started showing them off to friends and visitors and were visibly moved by seeing them. It appears that this appreciation stems not only from the macaws’ physical beauty but also that the macaws have some intrinsic value attached to them. To the people, they symbolise beauty and freedom, natural wonders and second chances. Everyday, the macaws are seen over Punta Banco and yet still I see kids running out of the school’s classroom to catch a glimpse of a screeching macaw as it flies by. Local Guaymí child growing up in an environment where macaws have become an icon of hope and pride again. Conservation begins at home. One-off conservation education blitzes can be useful, presentations based on new ideas and conservation goals can be both interesting and informative, but perceptions do not change in a day. For the perception of an individual to change, one needs to cultivate a development in the consciousness of an entire community (or population). This can only happen with regular interaction and reinforcement of conservation ideas and ideals, most effectively done by living the example. People and communities respond well to conservationists who are both passionate about their work and sensitive to the needs of the people. With this in mind, we live and work with the people of the area, trying never to preach but always willing to ‘chat’ about ideologies with our new friends. Volunteers and researchers are encouraged to meet and make friends with as many people in the area as possible. We regularly call upon houses to meet the residents and ask/talk about the macaws, knowing that each new friend we make is not only a personal friend but also a friend of the macaws. This network of ‘friends of the birds’ (Amigos de las Aves in Spanish) has the added benefit of having eyes everywhere watching for those who would harm the animals for their own benefit. It has been obvious that the appreciation of one species results in the deeper caring for nature as a whole. This concept has also worked in the macaws’ favour as a result of the dedication of Tiskita Jungle Lodge and a local sea turtle conservation project . The entire consciousness of the community is evolving toward an appreciation of, and a desire to protect, the natural environment, and people who can see the intrinsic (or extrinsic) benefit of conservation will not hesitate to protect it. The environment needs to have a value placed on it. Many projects have tried to do this by creating a monetary rewards system for communities, but these often lack the financial basis to make a substantial contribution to the income of all the people in the area. In addition, rule enforcement and management by outside agencies ignores the potential for education based on mutual respect, friendships and kindness. We have found that the development of a conservation ethic by ‘osmotic friendship education’ generates a value system based on the simple presence of species and ecosystems. As one resident said, “I want my children and grandchildren to know these [animals]…and to know them here.” This desire for conservation is ensuring the success of conservation efforts in the Punta Banco area. We now (in 2010) have 50+ Scarlet Macaws gracing the skies of Punta Banco, including at least 16 fledglings, ready to brighten the lives of the next generation of Costa Ricans. 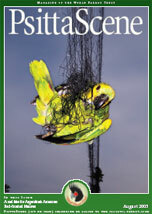 This text was originally published as an article in PsittaScene, the magazine of the World Parrot Trust under the title: “Valuing what’s around you: how community support is ensuring the survival of the Scarlet Macaw” Vol 17.3 (no. 64). Ah, makes me miss my ‘Snickers’! You’re right… Snickers was smuggled in a very non-humane way into the USA, we found out later. While the Scarlet Macaw is the most popular, it is not the most expensive macaw. The intelligence of these birds is off the charts! She sang Opera most of the day, quoted the lock code on her cage to us each morning, and answered questions as well as our children. I surely do miss ‘Snickers’! Nice to hear that Scarlet Macaws have been successfully reintroduced around Tiskita Lodge. They are also making a come back on the Caribbean Slope of Costa Rica and are becoming seen with more regularity in the Sarapiqui area. Not sure if this population is also due to reintroduction or if some of the birds have come from wild populations in southeastern Nicaragua. @Patrick, the last I heard was that the scarlet macaws on the caribbean slope were coming from southeastern Nicaragua, as you mentioned, but I am not sure if this is a positive development (the population is expanding), or a sign of growing pressure (habitat or otherwise) in Nicaragua. Where are you based, btw, in the valle central? @Dale- yes we can only hope that they are expanding naturally. I live in the Central Valley in Santa Barbara de Heredia but yearn to be in more birdy areas of Costa Rica pretty much every day.